Nagesh Belapure and Budumuru Adinarayana. "Strength Characteristics of Organic Waste Concrete." Journal 4 Research 2.9 (2016): 1-6. Pankaj Raut. "Selection of powertrain to achieve performance of vehicle ." Journal 4 Research 2.9 (2016): 7-12. Sissy Annamma Johnson and Josmy George. "A Survey on Different Types of Clustering Based Routing Protocols in Wireless Sensor Networks." Journal 4 Research 2.9 (2016): 13-16. Mohammad Zubair Mohammad Rafique and Mohammad Shakebuddin. "Design and Optimization of Human Teeth using FEA." Journal 4 Research 2.9 (2016): 17-19. Ms. Gayatri D Patwardhan and Prof. B. W. Balkhande. "Homomorphic Authenticable Ring Signature Mechanism for Public Auditing on Shared Data in the Cloud." 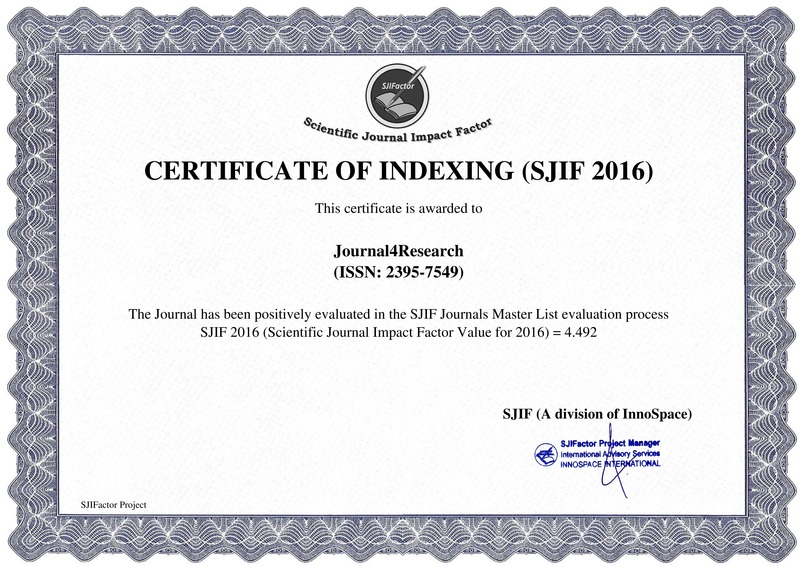 Journal 4 Research 2.9 (2016): 20-26.